Our fresh, high quality Elk Antler chews hold up longer than any artificial or man-made Slaughterhouse Waste treats made of compacted starch, rawhide, and unmentionable animal body parts. Keep your Dog safe by avoiding the Slaughterhouse waste products like the Rawhides, Nylabones, Pig Ears, Bully Sticks, and other Man-Made unmentionables. Instead, reward your Dog with OUR fresh, high quality, totally organic, wholesome and healthy Yellowstone Premium Elk Antler Dog Chews, sourced only from within USA. Please avoid buying poor quality Elk antler chews for your Dog from the Big-Box Stores. These older, weathered and biodegraded Antlers are not entirely safe. They have been laying out for years in the mountains, this subjection to heat and moisture in combination promotes a rot process within the marrow center of the Elk Antler. 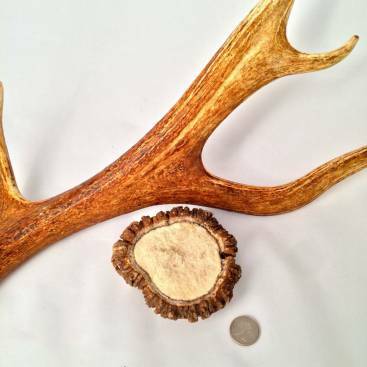 These lesser quality antler chews are a risk and more prone to cause You and your Dog problems. Fresh, Yellowstone Premium Elk Antler Chews contain many beneficial bio-nutrients and NO artificial flavorings or additives, just fresh wholesome Elk Antler! Fresh Elk Antler Chews are virtually impossible for your Dog to chip or splinter when they are being chewed. Your Dog's chewing action grinds the Elk Antler down very slowly. 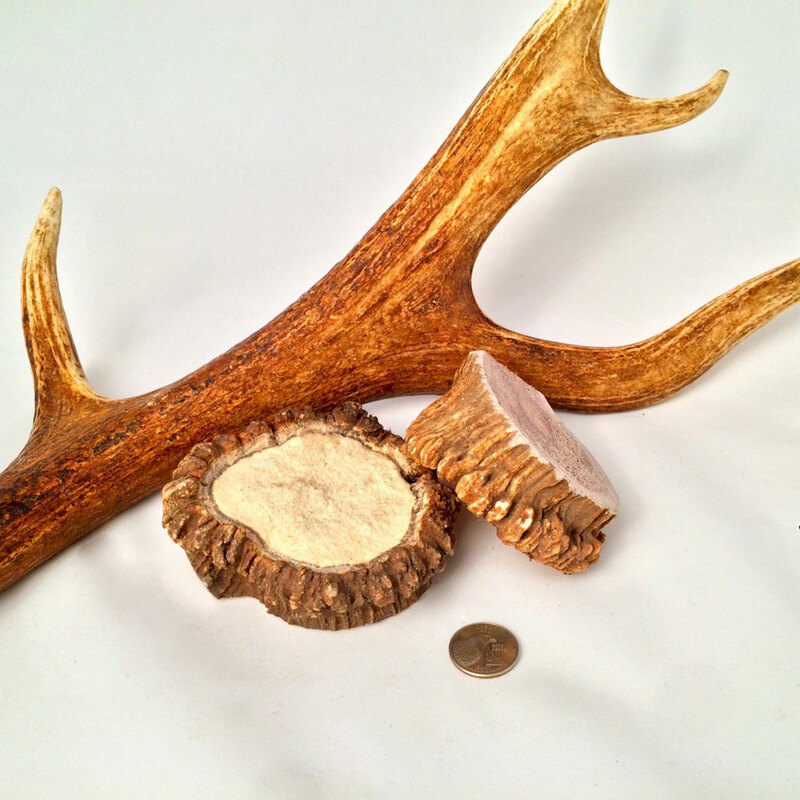 Our High Quality Elk Antler Dog Chews have virtually no odor or residue to get on your carpet or furniture. 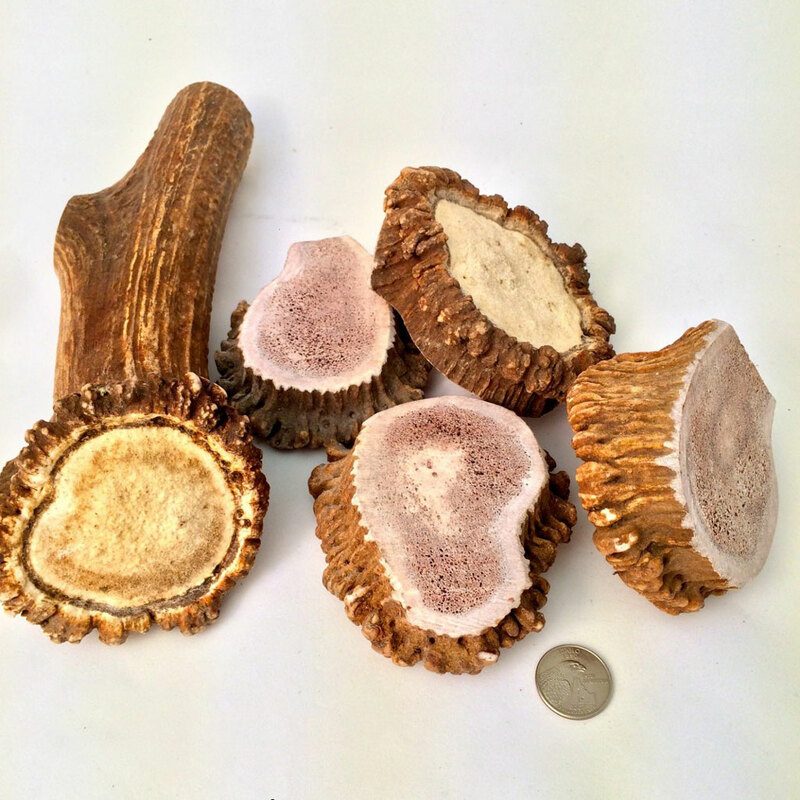 Our Elk Antler Chews will vary in shape, thickness and color chances are your dog will enjoy the variety of these Elk Antler Chews. Ranging from 2.5”- 4” across and around an inch thick these Heavy Duty chews are going to last! The Burr is the base of the naturally shed antler that was once connected to the skull of the elk. We can cut this section off and make belt buckles and other craft item as well as long lasting. Unlock your Dog's natural instincts the healthy way, BUY Premium Elk Antler Chews today! Premium Elk Antler Dog Chews are an annually renewable resource! 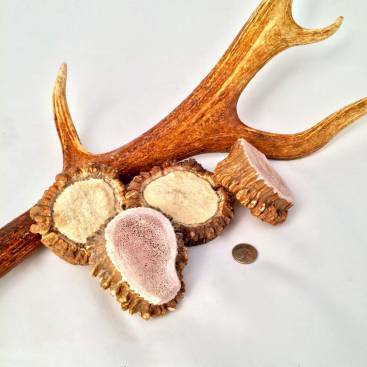 Our premium quality Elk antler chews are 100% all natural, odor-free and very long lasting. These antler dog chews come right out of nature each spring shortly after the elk drops them, so they are completely unprocessed and are a natural and Annually renewable resource, a rare hard to find win-win for the environment and your Dog! Our Elk Antlers contain NO artificial or added Hormones, Antibiotics, Animal By-Products, Steroids or Preservatives. Always supervise your dog when giving Elk Antler Treats. Discard any small leftover pieces that could possibly be swallowed. Always provide plenty of fresh, clean water.